Poor February. It’s the little brother of the calendar, never quite matching up to the longer months. But every four years, it puffs up its chest a bit with the addition of an extra day. 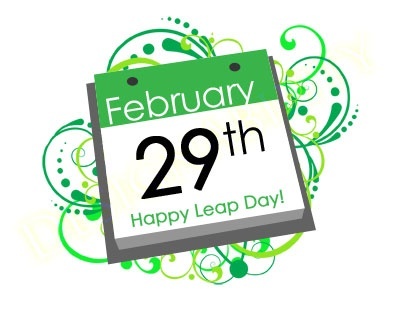 I love the novelty of Leap Day, even though it occasionally gyps me out of a coveted Friday or Saturday birthday. February 29 is a bonus day, but, as such, how should one choose to spend it? Is it a do whatever you want because nothing counts day (i.e., whatever happens on Leap Day stays on Leap Day), or is it a day to take a real shot at something meaningful? Or maybe a little bit of both. We’re told how to celebrate most holidays, whether it’s with candy and flowers, fireworks, or green beer. But I say that Leap Day should be celebrator’s choice. So, writer friends, it’s up to you. If you’ve been working so hard on a manuscript that you’re revising it in your sleep, perhaps your Leap Day should be spent with crossword puzzles and a bottomless cup of tea, or a double feature of completely mindless entertainment at your local movieplex. Cheesecake for lunch is also a viable option. But if your writerly self has lately been feeling hampered by self-doubts, intimidated by the prospect of success and/or failure, and generally reluctant to strike off in any direction, then perhaps February 29 is your day to take a leap of faith. Send a query. Enter a contest. Register for a conference or sign up for a pitch session. Write a first word, a first line, a first page, a first chapter. You may like it so much that you’ll want to treat every day like it’s Leap Day. Except for the cheesecake for lunch part. My leap is sending off one of the short stories I’ve been sitting on for a while. What will your writer’s leap be? 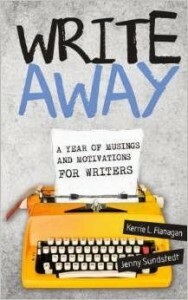 This essay by Jenny Sundstedt is from, Write Away: A Year of Musings & Motivations for Writers, a book with co-author Kerrie Flanagan that gives writers the inspiration, tools and resources needed to achieve success. Published by Hot Chocolate Press. Giveaway: Kerrie Flanagan will give away two copies of another Hot Chocolate Press book, And Then I Smiled to readers. To enter, please leave a comment by March 11. For bonus entries, readers can like Hot Chocolate Press‘s Facebook page and/or sign up for the Hot Chocolate Press monthly newsletter.